Every once in a while there comes a racing game that truly epitomizes the thrill and adventure filled within racing opponents on a track with sharp controls and beautifully detailed environments. Gran Turismo 5 is that very game. 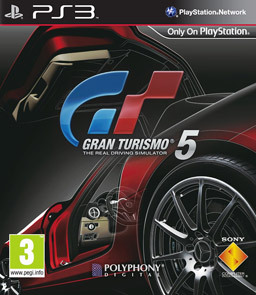 Published by Sony Computer Entertainment and developed by Polyphony Digital, the game is a rich experience for all those players who truly believe that a racing track is meant for professionals and requires certain skill and expertise to place at top position within it. This game marks the entry of the series into online racing with support of up to 16 players at a single time. Looks and feels like an actual racing game complete with superb racing tracks, tight corners and sharp controls. The game is visually very appealing as well as filled with brilliance in the area of designs. The inclusion of weather system is a great addition. It’s the first game in the series to provide the player with a damage model depending on the type of car selected. Loading screens can become frustratingly long at times. There are also some strange design choices. The game’s graphics are rendered with flawlessness with only a few issues that pop up from time to time. Car models shine with pristine quality as the light bounces off the hoods. Race tracks are crafted with extreme finesse making the event come alive. Environments are packed with detail to woo the player. There are moments which reign supreme with sheer beauty as s ome of them shy away due to odd ugly textures. The audio isn’t as good as the visuals as there are quite a number of problems in this area. The car engines do not sound as good as they should. The engine notes lack grunt and raw power. Apart from that the soundtrack is nothing out of the ordinary and fails to stir emotions that represent any kind of excitement from within the player. Gran Turismo 5 is separated from all the other games of the genre due to one simple fact and that is its realism. The handling of the car and the controls has to be the most precise a player has seen and felt in years. Controls are very sharp and the turns and twists in a race track are deadly leaving no room for mistakes. There are bunch of new cars to drive and take out on the tracks as well as being accompanied by a host of new tracks that provide a very neat challenge to the player. The best part is that licence tests are no longer mandatory that eases things down a bit. Visually it’s a mixed bag. The online lobby system is outdated to say the least but multiplayer does provide a great deal of fun. Winning races early on feels cheap as the player can enter with powerful cars. Gran Turismo 5 is certainly the cream of the crop with can certainly use some patches to iron out the several glitches that plague the gameplay and graphics. Other than that it is a solid racing experience.